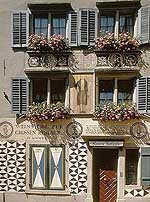 The city of Zurich was established as a Roman customs post (called "Turicum") in 15 B.C. 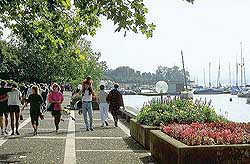 It is situated some 400 metres (1,340 ft) above sea level at the northern end of the 27 km (17 miles) long Lake of Zurich. Its well-preserved Old Town is to be found on both banks of the River Limmat, which flows out of the lake in a northerly direction. With a population of approx. 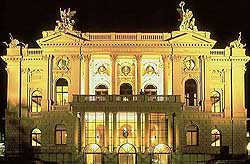 380,000 inhabitants, Zurich is the largest city in Switzerland. It is surprisingly compact, though, with a wealth of old churches, fountains, and cobbled streets with buildings, some of them more than 700 years old, housing charming galleries and small shops. Regular scheduled flights from every continent, and most countries and major cities of the world, land at the international airport at Zurich-Kloten: it is among the largest and most efficient airports in Europe. A train service every quarter of an hour whisks passengers from the airport to the city centre in just ten minutes for CHF 6.00. Take a look at the Swiss timetable for up-to-date information about Swiss Airlines flights to Zurich. Over a thousand trains halt daily at Zurich's centrally located main railway station. Direct and frequent services to all the large Swiss cities as well as major European destinations ensure a pleasant journey. Please refer to the official homepage of the Schweizer Bundesbahn (SBB) (Swiss railroad service) for up-to-date railway schedules and reservations, or visit your location national railway agency. Zurich's Public Transport System operates a comprehensive, modern tram and bus network. Vehicles run daily between 5.15 am and midnight, with services every six minutes during rush hours. Tickets offer unlimited travel on public transport within the corresponding zones and time period. Detours, return journeys and stop-offs are allowed, and you may also change lines or modes of transport. For schedules and tickets please refer to ZVV. Weather: With its geographical latitude of 47 degrees 23 minutes north, Zurich is only slightly closer to the north pole than to the equator. The climate is moderate with no excessive heat, cold or humidity. The average high at the end of March is 12 degrees Celsius, the average low 4 degrees Celsius. For the latest weather forecast, check CNN's Weather Forecast or USA Today. 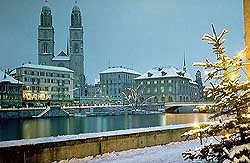 March usually offers great skiing and snowboarding, and Zurich is close to many great Ski-resorts. See the Tips for Winter by Switzerland Tourism, or one of the many online ski guides such as Bergfex or Skiinfo for up-to-date information on snow conditions. Currency: 1 Swiss Franc (CHF) is about 0.86 US Dollars, or 0.69 Euro (as of October 2008). For current exchange rates, see the Universal Currency Converter or Oanda.com, which offer detailed conversion tables, for example for US Dollar and Euro. Coins in circulation are 5, 10, 20 and 50 Cents (1 Franc = 100 Cents), as well as 1, 2 and 5 Francs. Swiss bank notes come as 10, 20, 50, 100, 200, 500 and 1000 Francs bills. Passport/Visa: If your stay is shorter than three months you only need to bring your valid passport with you, a visa is not required. This applies to citizens of the following countries: countries of the American Continent, Europe, Japan, Australia and New Zealand. Exceptions may apply. For more detailed information on visas, please contact the Swiss Consulate General located nearest you. Online information is available from the Swiss Embassy in France and Great Britain.